Music is like a pill to babies. Play a familiar song and you’ll see their faces light up, their bodies sway, their hands clap and often, their mood changes. Researchers from Mcmaster University have discovered that infants who are exposed to music before they can walk or talk tend to smile more and communicate better. They also have a more sophisticated brain response to music. How about that for a simple baby developmental toy? Babies don’t need a lot of toys. But musical toys for babies are ones of the best you can give. Make them or buy them. Sing to them as often as possible. Expose them to different genres. Give them the gift of music. 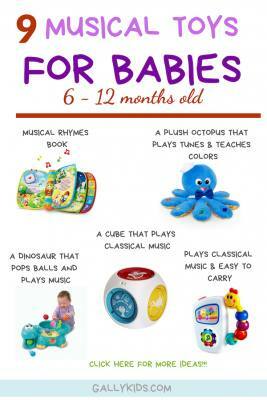 Here are some of the best baby musical toys for 6-12 months old. 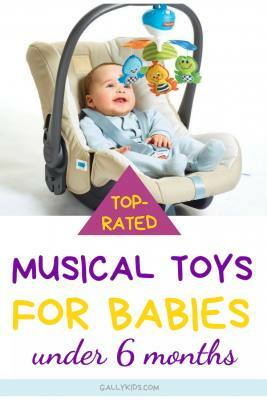 If you’re interested in the best musical toys for babies under 6 months, click here. 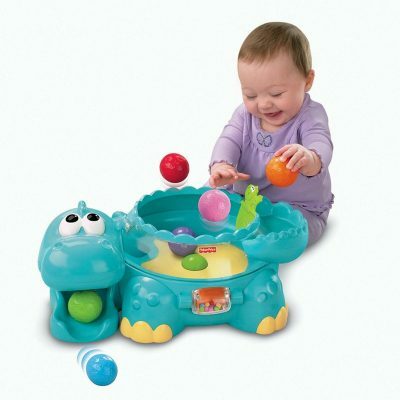 This Poppity Pop Musical Dino that pops balls is a pretty popular and highly rated musical toy for babies. Upbeat music and sounds come out of this dinosaur. But this isn’t the only reason why babies love it. They love it so much more because of the popping balls that come out of it. So how exactly does this work? The dinosaur comes with 6 balls. The baby (or you) puts the balls into the dinosaur and then they pop up gently. Some of these balls eventually pop out or go out of the dinosaur’s mouth. There are so many things at work here for your baby’s development. The colorful popping balls stimulate his senses. He might even try to catch the popping ball which improves hand-eye coordination. And then when the ball rolls or pops out, he would then crawl (when older) towards the ball, thereby exercising his large motor muscles. So all in all, pretty good for a dinosaur baby toy! A maraca, rainbow shaker, rattle and a bell in a cage. These are the instruments included in this 4-piece baby band. This is an award-winning toy having won the top toy of the year award by the Creative Child Magazine. All 4 different musical toy instruments are perfect for babies. Each instrument does a different thing which often entertains and captivates an infant. They’re also designed so well that as soon as babies are able to hold on to things, these are very easy for them to grasp. I’ve already written about this award winning baby toy on our page of the best musical toys for babies under 6 months. 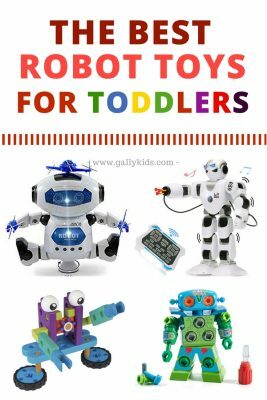 I’m writing about the Baby Einstein Take Along Tunes here again as it is one of the best-selling and highly rated musical toys for babies. Why? My gut instinct says that it’s because this toy covers a lot of bases. Third, it’s just the perfect size for babies to grip when they’re ready and for you to carry around wherever you go. Check it out in the video below and see for yourself. Imagine a baby who loves soft plush toys. 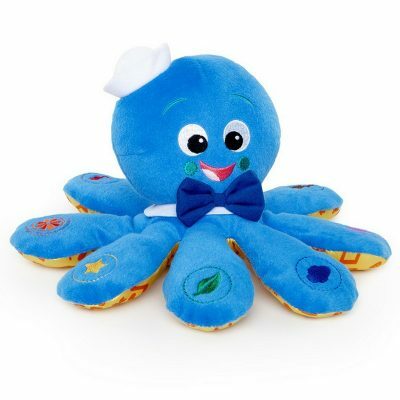 But then this Baby Einstein Octoplush toy actually makes music when you give it a hug! How much would he want this toy? Turns out, quite a lot! So says a lot of parents. 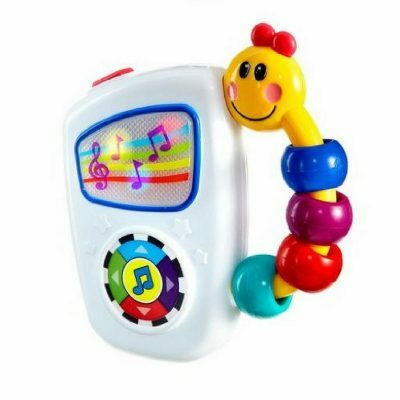 Apart from being a cuddly toy musical plush toy, this also plays some tunes and teaches babies colors. And if English is not enough to know colors, it’s also available in Spanish and French. Babies generally love balls. There’s something about an object that moves by itself that’s pretty fascinating! Now turn that ball into a musical stuffed toy and you get yourself a winner. This Laugh and Learn Singin’ Soccer ball may not be what you have in mind when thinking about a musical plushie for your baby. But it’s just as good. It’s a cuddly stuffed toy, a “teacher” for learning and one that helps with developing gross motor skills. 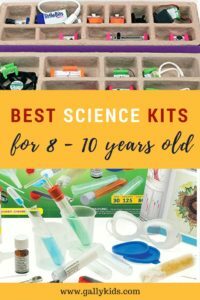 You can get this for a 6-month old and when properly taken cared of, you might just find that she’ll still continue to play with it on to toddlerhood. After all, toddlers usually love to kick and throw balls. This plays some familiar songs and also introduces numbers, opposites, and colors. 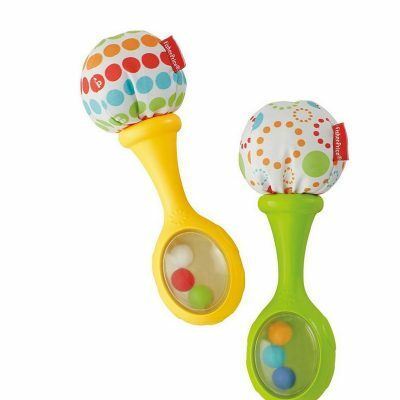 These don’t make exactly the same sound as a real pair of maracas but babies love this Fisher-Price Rattle And Rock Maracas. It’s perfect for infants under 6 months. It makes a sound when babies shake it. But apart from that, it can also double as a teether as babies seem to like to bite it! The good news is that one end is very soft and squishy. 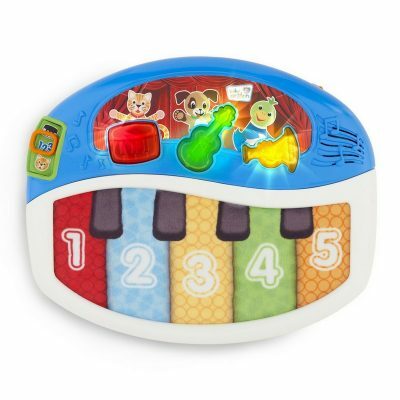 Start them young with this Piano discovery toy for babies. No. It’s not a real piano as you can probably expect from a plastic one like this but it is a good introduction to music, songs, and musical instruments. The piano keys have three different modes: music, notes, and learning. You’ll most likely find that as your child gets older, he will also play with this toy in different ways. At first, he may just use it for banging or just listening to the music. And as he gets older, he might even be more interested to know how the different keys produce sounds as he presses them. There are many different kinds of electronic books for babies. 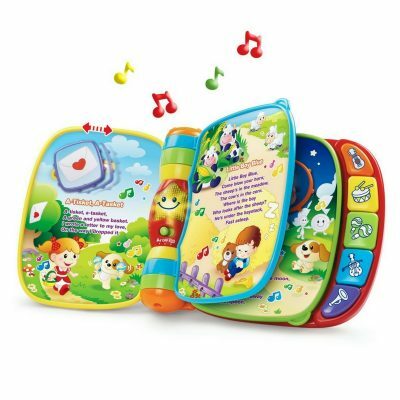 What makes the Vtech Musical rhymes book different is that it is easy for a young baby to make it work. The pages of the book have buttons that are easily moved from one side to the other. This movement activates music or sounds. 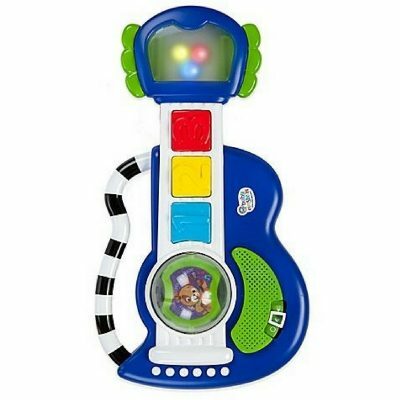 If your little one loves music, this is a great toy to take with you on long-distance car trips or on flights. Don’t worry about the noise because you can control the volume. So what do babies learn from this? First, they get to practice fine motor skills as they move the buttons and flip the pages of the book. Secondly, the book itself has over 20 different kinds of nursery rhymes, teaches the sounds of animals, colors and more. 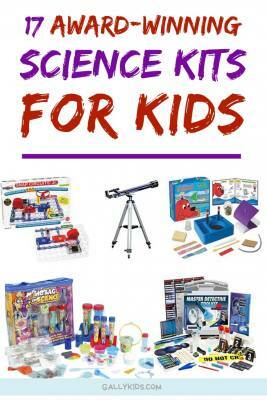 It’s a pretty useful, not to mention, entertaining educational toy for kids! 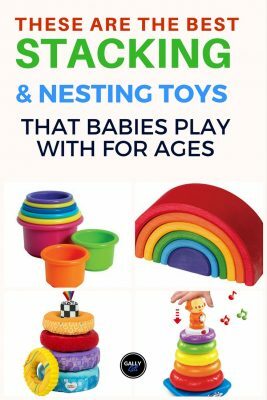 Baby activity centers are one of those toys that can grow with your baby and this one does not disappoint. One good thing about this is that the legs are removable. This means it can start as a toy on the floor when your child can’t sit/stand yet. Really young babies love kicking and pressing buttons. It’s even an effective incentive for babies to lie on their tummy and prop themselves up for play — all good for fine and gross motor skills! 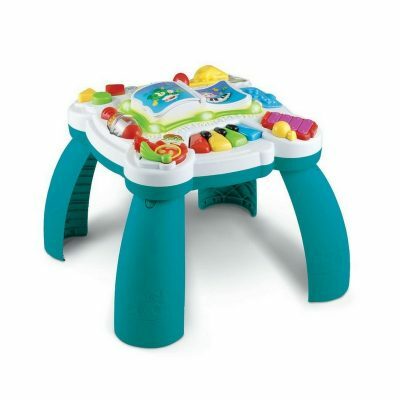 The Leapfrog Learn And Groove Activity Center have two modes: the dancing or music mode and the learning mode. The music mode plays traditional music and the learning mode introduces babies to shapes, colors, alphabets and more. This is also bilingual! There’s a Spanish mode if you want your child to start learning another language. 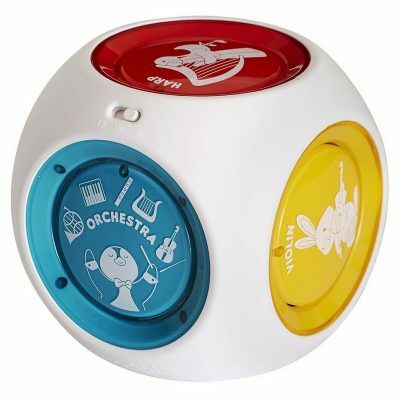 Your baby will love the wonderful classical music that comes out of the Baby Einstein Munchkin Mozart Magic Cube. Now, if you’ve got the ear for music, you will love this too. Why? because the music that comes out of this “toy” sounds like real instruments being played. This is just the right size for a young baby to handle. You may have to push the buttons yourself at first but as soon as she is capable of doing it by herself, you’ll see that she’ll be just as amused and excited to be able to “command” it to play. This is a toy that’s very well thought-of. Each of the 7 different kinds of classical music is played using a different instrument at the push of a button. Pretty neat. 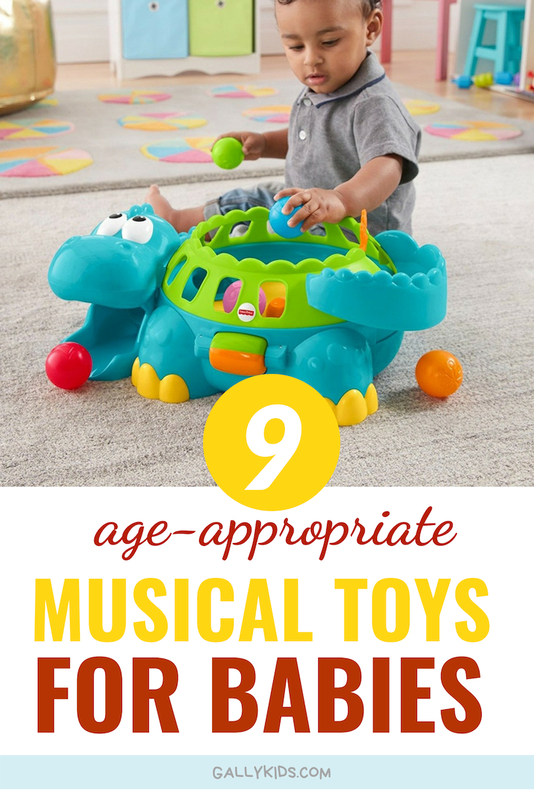 You’ve probably noticed that a lot of the baby musical toys play classical music. And this Rock and roll guitar does the same thing. Babies can press the buttons to activate the music. It also lights up which babies often like. Get the music going even when your child is in the bath with these Do Rae Mi dolphins. These dolphins don’t play music but tap the head a different note will come out of each dolphin. Apart from these musical notes, these dolphins can also be used for scooping water, for learning (by putting each dolphin into each corresponding seat color). And who knows, you might have a music prodigy and she’ll be playing a song with the different notes. These Explore and More musical instruments are not only for regular play. 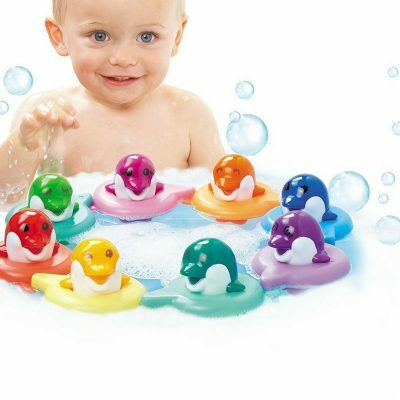 Your baby can also use this set of musical instruments while playing and splashing in the bath. Perfect for babies about 6 months when they can grasp on to things. The three instruments are a hand drum with rattle beads, a fox tambourine with a bell and a bee clacker with wings. 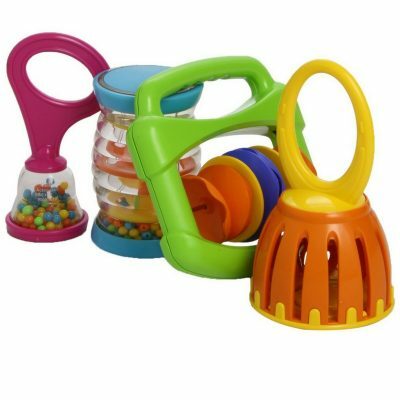 There are many different types of baby musical toys to choose from. But always remember that at this young an age, it is your presence, attention, and love that is most important. If you prefer a more minimalist approach to toys, singing to your infant, listening to the radio or banging tin cans benefit a growing child just as well.